"Custom Inspirational Ring Silver, Stackable Single Band"
Encouragement rings and rings of inspiration can bring you or someone you know constant joy. Choose a word or short phrase to create a custom ring with words, names, dates or short phrases that will remind you of the joy of life. Do you or someone you know need a simple reminder of what you have to be thankful for? 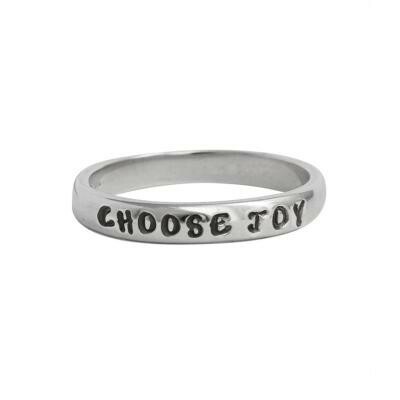 Create a custom ring with words to encourage, inspire or bring you joy. This listing is for a sinlge but we also have double and triple band rings available. Dimensions: The sterling silver bands are approx 3mm wide and can be stamped with up to 12 characters/spaces. You can purchase 1-3 rings and make a custom stack ring too! Prices include stamping. Because this item is customized all sales are final. Sizing: When determining your size, we ask that you give us a size that is a snug but comfortable fit. If you are unsure of your size, you can purchase a ring and select ring sizer from the dropdown menu. We will send you a ring sizer and instructions on how to email us your size. If you are stamping three or more single rings you need to consider going up a half size or whole size to account for the thickness of the band.